In Assen and other Dutch cities, traffic lights are used to control motor vehicles. Cyclists do not require traffic lights on their own but only on some occasions when they come into the same junctions as motorists. Assen provides an excellent example of how to minimise interactions between cyclists and drivers. The city also provides an excellent example of how few interactions with traffic lights there can be for cyclists where the infrastructure is well designed. Every traffic light in Assen. Note how the centre of the city and residential areas have no traffic lights at all. Most traffic lights are on main routes for cars, not for bikes. Some spots show more than one set of lights. There are many misconceptions about how cyclists use traffic lights in the Netherlands. In order to try to explain how cyclists really use traffic lights in the Netherlands, this blog post shows every traffic light in Assen and explains what interactions, if any, cyclists have with each example. You will see from the map above that there are few traffic lights in this city and those which exist are almost entirely on the main routes for motor vehicles. Residential areas have many junctions but no traffic lights in them at all. The very centre of the city also has no traffic lights at all. Many journeys by bicycle can be made without interacting with traffic lights. It was a specific goal when building the new suburb of Kloosterveen outside of the city on the west, that new residents would be able to reach the city centre by bicycle without meeting any traffic lights along the way. Traffic lights do occur on the motor vehicle route from the new suburb to the city. Traffic lights are to be found where there are most cars, not where there are most bicycles. In many cases, due to the unravelling of driving routes from cycling routes, these traffic lights are not used by cyclists at all so never cause any inconvenience. Most cycle journeys do not involve repeatedly stopping at traffic lights. Traffic lights controlled crossing are also provided to help cyclists to make convenient and safe crossings of major roads. There is also a traffic light at this location which occasionally stops both cyclists and motorists travelling north-south if a bus goes along the bus-road parallel with this cycle-path. However this defaults to green for both bikes and cars and provides only a very rare and very brief inconvenience. Earlier videos demonstrate both junctions six and 13. These are just as convenient for cyclists as the crossing illustrated in the video above. One cyclist injury in Assen occurred at a crossing like this. In Assen, traffic lights prioritize cycling. One of the ways in which this is done is the use of simultaneous green lights on which cyclists ride in any direction, including diagonally, across the junction with no interaction whatsoever with motor vehicles. These are combined with being able to turn right against a red light. Junction 22 is a mid-sized simultaneous green junction which has featured several times on this blog but this principle can also be used successfully on smaller and large junctions. Where cyclists use traffic light junctions, the simultaneous green layout is the most convenient and safe way to do this. No cyclists have been injured at simultaneous green traffic light junctions in Assen. Junction nine is interesting because west-east (the most common direction of travel at this location) cyclists will only have their journeys interrupted by this traffic light if they are on the southern side of the canal, which is a secondary route. The North side of the canal is a bicycle road which offers the primary route for cyclists. It provides a direct nearly-car-free route to the city centre with no delays due to traffic lights for people who live on the west of Assen. The main route for motor vehicles is also west-east in this location. The north-south route connects to residential feeder streets with lower traffic levels. Three junctions in Assen default to a green signal for cycling and only make cyclists stop if a driver has triggered a sensor. The intention is that it is normally the case that you ride over these junctions without stopping. There are videos which demonstrate both junction 3 and junction 17. No cyclists have been injured at default to green crossings. 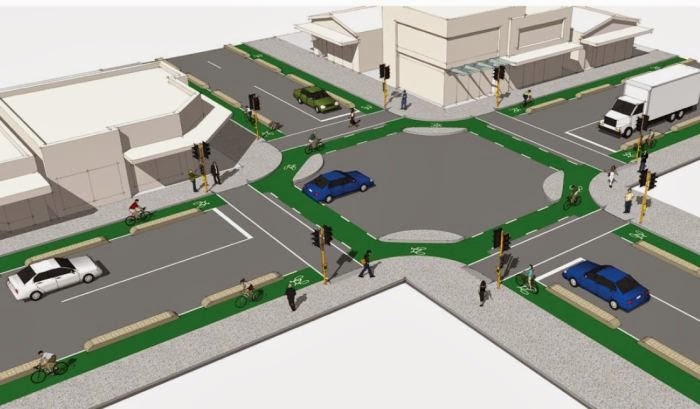 These junctions simply don't exist so far as cyclists are concerned. They regulate motor traffic along busy roads which provide routes for motor vehicles completely unravelled from cycling routes. 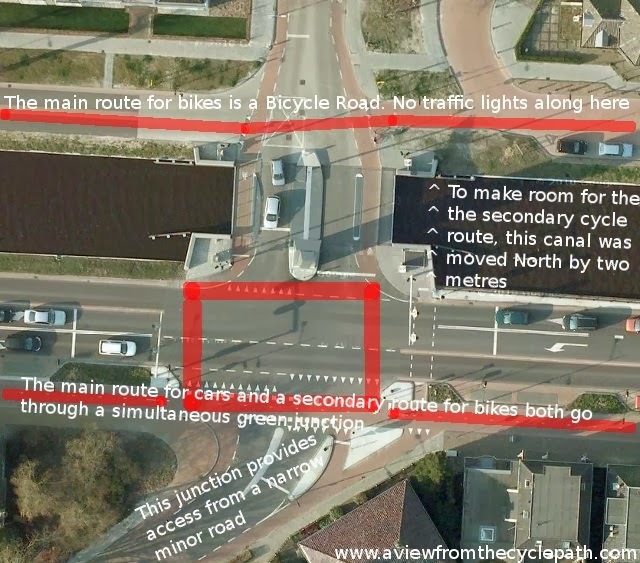 Previous blog posts cover how cyclists use an underpass so that they never have to stop at junction seven and how junction 26 exists only on the unravelled motor vehicle route. Junctions 16 and 18 don't apply to cyclists at all even though they are in line with junction 17 which defaults to green for bikes. You can see them in this video. Junction twelve is being rebuilt right at the moment. It was the home of the nearest thing we had in Assen to an advanced stop line. 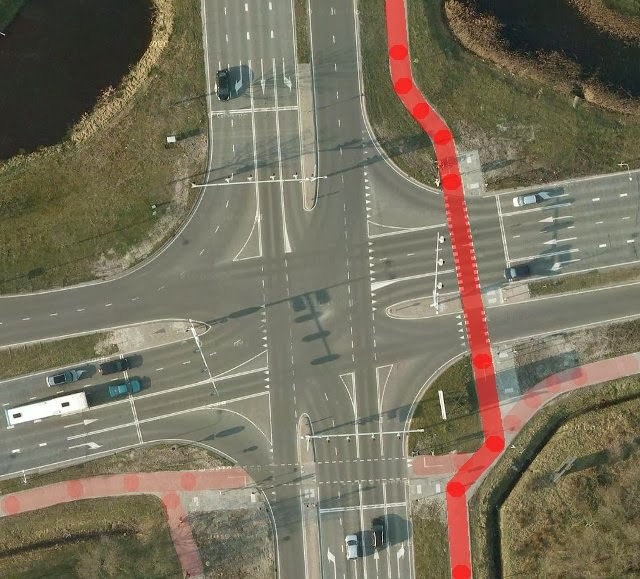 I used it in a blog post four years ago to demonstrate why London's new design for Bow Roundabout would be dangerous as even the old design of this junction in Assen already eliminated the conflict which London was building into a new design. Update: Since this blog post was written, junction 12 has been upgraded with a much improved design making cycling even more convenient and safe. Junction 25, at the hospital entrance, is a major junction for motor vehicles combined with a simple crossing for bikes. These junctions are nearly invisible to cyclists because they serve traffic on the ring road and in industrial areas and cyclists routes are mostly unravelled from them. When we do have to ride near these roads we often ride alongside them and do not cross. Nevertheless, when we do cross at these points, the delay to get a green light for bikes is not excessive: generally less than 30 seconds. Junctions 15a and 15b are both very large and very busy. Both of these junctions have injured cyclists (five in total at these two junctions). There is never a requirement for cyclists to stop in the middle of the road and operate a second traffic light in Assen, no matter how many lanes are crossed. The blue bridge which the cyclists go under carries only cars, but it was built for the benefit of cyclists so that there did not need to be a traffic light on the cycle-route. Find out more about this. Where there is a requirement for cyclists to be able to turn right, these junctions provide for safe right turns when there is a red light (a privilege which motorists don't enjoy in the Netherlands). It is very rare that anyone should have to ride across two arms of these junctions as part of one manoeuvre because in each case, another route exists. Junction eight is really only a crossing so far as cyclists are concerned. It featured in a video showing children on a school trip. highlighted. This is being changed. Junction 24 almost made it into the major junctions category. It doesn't cause many problems for cyclists, but it does represent an older attempt at providing cycling infrastructure and the work has already started on replacing that junction altogether within the next few years. Junction 21 is an interesting example. It's the least satisfactory traffic light junction in Assen and because it's right next to the railway station, it's one of the first pieces of infrastructure that people see when they visit the city. This is the closest example that we have of the sort of thing that seems to come to mind to many people outside this country if they try to think of what a typical Dutch traffic light junction looks like. It's actually one of the oldest pieces of infrastructure in this city, dating back to 1989 when the existing railway station was built. Two cyclists were injured at this junction. This junction dates from the 1980s. It's the most awkward traffic light junction for cyclists in Assen and often requires people to make a two-stage turn. Don't take inspiration from older infrastructure like this. It is soon to be removed. The railway station as well as the junction are to be replaced in the next few years and the traffic lights are going away. Most of the problem with traffic here is caused by through motor traffic travelling North-South. This traffic will use a tunnel in future. The result is that the junction outside the railway station can be transformed into a far more pleasant space which will provide for access to the station by car but should not be dominated by motor vehicles. When this work is complete, this last of these older style traffic-light junctions in Assen will be gone. No traffic-lights will be required here once the main road is underground, greatly increasing convenience for cycling. The cycle-route between the railway station and the centre of the city will no longer have any traffic lights on it. The idea of changing places so that motor vehicles don't dominate is not new to Assen. Like all city centre streets in Assen, and across the Netherlands, the streets in the photo on the right was dominated by motor vehicles in the mid 20th century. This was the busiest street in Assen and the first traffic lights in the city were installed here in order to deal with the traffic. However, the city centre streets are now either completely car free or now nearly car free. They can still be used as a through route by bike but not by car. The removal of through motor vehicles meant that the traffic lights were no longer needed at this location or several others in the city centre, making cycling more convenient. Watch a video which demonstrates this street in action in the 1970s and now. How well does this combination of junctions work ? Every junction in Assen, whether with traffic lights or otherwise, can be used safely by every cyclist in Assen. What's more, this infrastructure is not only safe but also convenient. Children, older people, those with disabilities all use the same infrastructure as confident adults and fast cyclists because the same infrastructure works best for everyone in terms of both safety and convenience. No-one is expected to choose between a safe route and a convenient route. Of Assen's 28 traffic lights, six simply don't "exist" so far as cyclists are concerned. Two more of the local traffic lights have only incidental influence on cyclists. 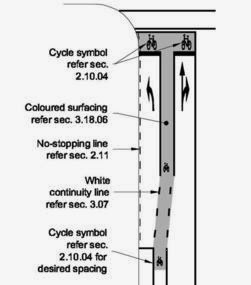 Three are provided specifically to create safe crossing points for cyclists and three more default to green for bikes so rarely cause slowing for cyclists. set of traffic lights by the station. Only half the traffic lights, fourteen sets, remain to be considered. Four of these are of the excellent simultaneous green design which provides the best combination of both convenience and safety for cyclists. Nine are large junctions which we use rarely by bike but which are in any case safe and convenient if you should have to use them. Just only junction is annoying to use - the old junction at the railway station which is soon to be removed and will no longer cause inconvenience. Even at this location, though, there are ways in which many people can completely avoid the delays caused by that junction. Please do not build this ! In no cases at all in Assen do we have cyclists on the road mixing with cars at a traffic light junction. There are also no cases where cycle-lanes lead cyclists between streams of moving vehicles. There is no location at which cyclists clash with motorists or have to turn across moving traffic at all. There are no advanced stop lines (bike boxes) used in Assen as these are inadequate to keep cyclists safe. There are no two stage turns and certainly no instances at all of the dangerous design in which cyclists are expected to share their straight on lane with that used by drivers turning right. described as "Dutch" though it's not. but a small part of the picture. We also don't have any junctions of the type which have become known in some circles as a "standard Dutch junction" and this is a very good thing. The junction closest in design to these that we have is the outdated example by the railway station which, as described above, is being removed. 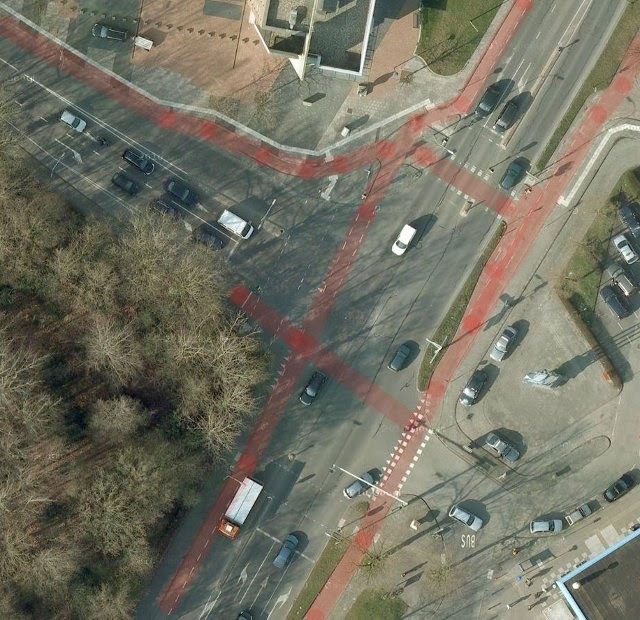 Yes, Assen is getting rid of junctions which look like that, not building more of them. Badly designed junctions lead to inconvenience. They perhaps also result in a reduction in safety as people try to find more convenient ways to make turns across traffic without having to stop twice. Unfortunately, the idea that there is such a standard traffic light junction design, that it looks something like this, and that it's something to emulate, has become popular. I've seen this idea pop up in many places. In this case, it's gone so far as to the other side of the world. It is precisely to help people to avoid making mistakes like this that we began running cycling infrastructure study tours way back in 2006. It's not too late for New Zealand's planners, or those from elsewhere, to avoid making expensive and dangerous mistakes. You can do a lot better than this. Contact us. Ask for advice. We're here to help you. Huge junctions on small roads ? We often have people ask us how the Dutch accommodate their "huge" junction designs on minor roads. The correct answer is, of course, that they don't do so because they do not need to. Most junctions are not "huge". Most junctions are not busy. This is by design. Most junctions simply are not on the routes of through motor traffic. You'll note from the map at the top of this blog post that Assen simply doesn't have many traffic lights, and large parts of the city contain none. Many Dutch towns are like this. In reality, at the most common design of junction in the Netherlands there is very nearly nothing at all to see. However, this is possible for reasons that go well beyond merely how you design traffic light junctions. Minor roads and residential streets have almost no motor traffic on them. To a far greater extent than other nations, the Netherlands has removed opportunities for rat-running. Cycling routes are unravelled from driving routes to a great extent, making routes for cycling more direct and allowing cyclists to avoid traffic light junctions on their journeys. The only junction at which stopping is irritating is the older style junction at the railway station. This is from another age and we won't have to put up with it for much longer. Readers may recall that when I visited London last year I was frustrated with the low speed and stop-start nature of cycling in that city. Many places in the world are like London in this regard. By contrast, it is rare that I stop for a traffic light when cycling in Assen and that is how it should be. Journeys by bicycle must be continuous and direct. If cycling is convenient as well as safe then people will cycle. Apart from the few traffic lights installed specifically to allow cyclists to cross roads, cyclists do not need traffic lights. What they do need is a very dense grid of very high quality car free, or very nearly car free, routes. If you want to emulate the Dutch success you need to emulate the best of Dutch practice. Don't make or accept proposals for second best. The material above is an example of what we cover on our study tours. We don't just talk about this, but we demonstrate the infrastructure so that participants can see for themselves how well it works. It's important to distinguish the features of modern Dutch infrastructure which make cycling accessible to everyone while also demonstrating where it falls down. Where the Netherlands has made mistakes, and where those mistakes have not yet been corrected, it's important that those things are recognized as what they are and do not form the basis for new designs elsewhere. Assen provides an excellent example of how to do the right for cycling. This city has no university and therefore does not benefit from a large student population which would boost the cycling modal share regardless of infrastructure quality. Assen's higher than average modal share for a Dutch city (a higher cycling modal share than any city outside the Netherlands) has been achieved by investing in a very comprehensive network of better than average infrastructure which is constantly being improved. On our tours we also visit Groningen, which for many years has been the top cycling city of the Netherlands. Different design choices were made in Groningen. There's also much older and less polished infrastructure than what we have in Assen. This gives an opportunity to compare how well different things work, to point out some errors and to show how older designs differ from modern designs. We're independent. This means we are not supported by government or engineering companies. We can be entirely candid about what is good and what is less good. We have no commercial reason to push one idea over another, we only tell you what works. Mitt writes: "It's really revealing of how endemic Britain's traffic problem is when a town of a similar size to Assen needs 102 signalized junctions in order to 'safely' function. And let's not forget that every single one allows both pedestrians and cyclists to travel through them, only the pedestrians (most of the time) get their own signal phase. 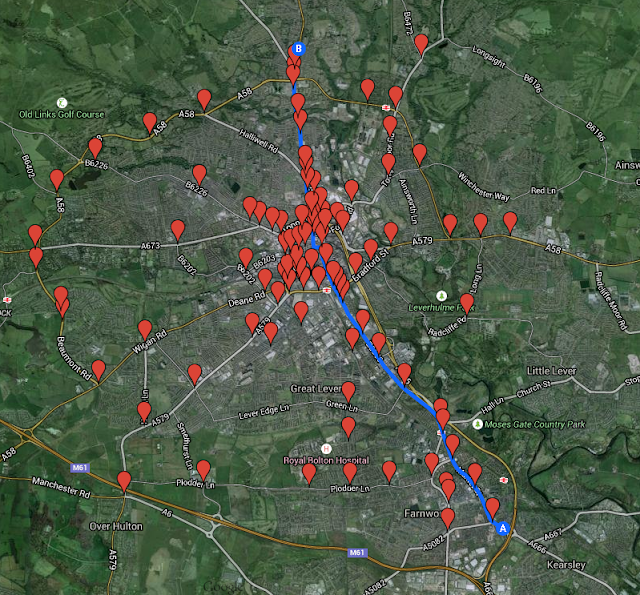 Some of these junctions are enormous, multi-laned deathtraps, and cyclists are expected to ride over them nonetheless." and further "The blue line is the most direct route cyclists could take from Farnworth, in the south, to Astley Bridge, in the north. It involves 25 separate traffic light junctions, almost as many as every type of signalized junction in Assen combined, just to travel this 5 mile journey." You can read his entire comment below. 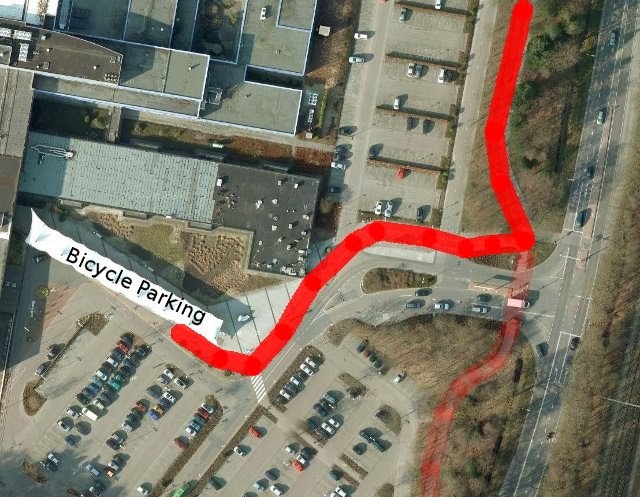 Another correspondent informs me that the blue line which has 25 traffic lights in a five mile distance is designated as a strategic cycle route. That does not make for efficient cycling. It seems the words are rather more impressive than the reality in this case. Just like the traffic lights, all the roundabouts in Assen also work very well for cyclists. 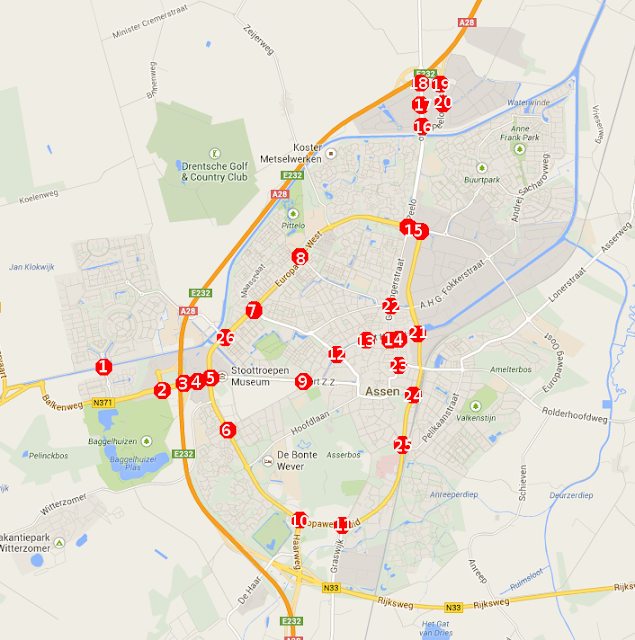 Read the older post "Every Roundabout in Assen". A quick comment about the maximum 8 second delay video: perhaps it is just an artifact of living in an area currently completely antithetical to the principles you excellently outline in your blog (Sunnyvale, California), but with a relatively narrow road to cross and little traffic I would never stop, press the button, and wait for a green light here. I wonder if it would be better to embed sensors in the floor to detect when a bicycle is approximately 5-8 seconds away from the light and use this to trigger the light change? I've just discovered your blog and am fascinated - keep up the great work! David: It isn't mentioned in this blog post (I have written about it before) but as well as buttons to press, there are always sensors under the ground which detect bikes. This junction is no exception, but because of the layout of cycle-paths just before the junction, the sensors cannot be far away. In practice, that light causes cyclists almost no delay at all. It's actually the only traffic light that people living in some of the villages south and west of Assen will see between their village and the city centre. It can easily be the only traffic light in 10 km or more of cycling. You'll have noticed that it's not 8 seconds but just 5 seconds in the video. Barely time to put your foot down and really nothing that anyone complains about. In practice, when the light is red but there's obviously no traffic on the road, some people do cross against a red light. However, the angles are such that you need at least to slow down in order to see along the road. (1) Though I would not be surprised at the greater reliability of the western European powergrid vis-à-vis the American powergrid, still, what is the back-up plan for simultaneous-green in the event of power failure? (2) Why did I not pose the previous question while I was there? Highwayman: Good to hear from you. I ought to explain about power cuts on the study tour. Of course there are many things which could be explained and a limited amount of time to do it in. Simple explanation: there are give way and stop lines painted across all junctions. These take precedence when the lights are out. People also expect to give way to the right. Power cuts are rare. We've had one five minute outage in six years. I was quite amazed when I saw your map of all the traffic lights in the city. I almost couldn't believe it at first, I had to go investigate on google maps to see that some of the junctions that seemed like they would have required signals (from my British perspective) were simply give ways, and the complete lack of signalized, dedicated pedestrian crossings. It's really revealing of how endemic Britain's traffic problem is when a town of a similar size to Assen needs 102 signalized junctions in order to 'safely' function. And let's not forget that every single one allows both pedestrians and cyclists to travel through them, only the pedestrians (most of the time) get their own signal phase. Some of these junctions are enormous, multi-laned deathtraps, and cyclists are expected to ride over them nonetheless. 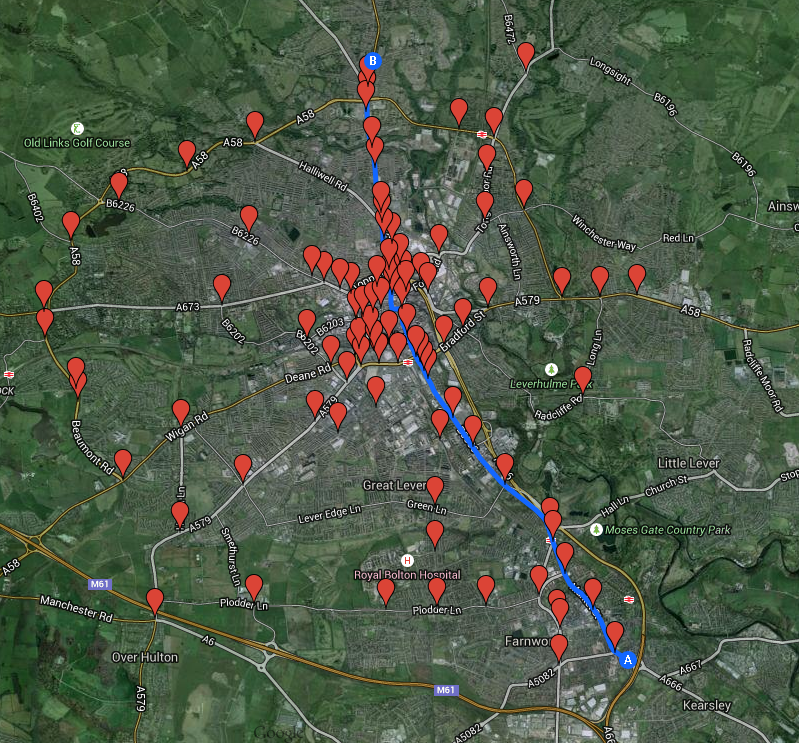 The blue line is the most direct route cyclists could take from Farnworth, in the south, to Astley Bridge, in the north. It involves 25 separate traffic light junctions, almost as many as every type of signalized junction in Assen combined, just to travel this 5 mile journey. There is a mostly traffic free alternative, but it involves travelling 6 miles instead of 5, riding on unpaved and cobblestoned sections with no lighting at night, all of which are shared use with pedestrians. This is the exact opposite of unraveling cycle routes from driving routes. Every single road on the blue line is a 30mph through route for cars with no protected space for cycling at any point, and only painted cycle lanes and advanced stop lines in some places. If I had included the dedicated pedestrian crossings, there would be hundreds more markers on the map. I must've seen 1 or 2 per mile of every main and distributer road in the entire town. Which says a lot about the levels of motor traffic in Dutch cities, so low that pedestrians and cyclists usually only need signalizing on major junctions. Mitt: Thank you for your excellent comment. This is precisely what I was getting at and I've updated the blog post to include your map and part of your comment.